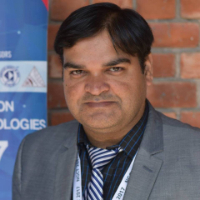 Dr Rajeev Tiwari did his bachelors and masters in Computer Science. Post that, he pursued a Ph D in Computer Science. He also has Amazon Web Services certification. He has served as an Assistant Professor at Maharishi Markandeshwar University, Mullana & at HEC, Jagadhri. He is an Associate Professor at University of Petroleum & Energy Studies, Dehradun. "I did bachelors and masters in Computer Science. Post that, I pursued a Ph D in Computer Science. I am aslo AWS certified. I have served as an Assistant Professor at Maharishi Markandeshwar University, Mullana & at HEC, Jagadhri. I am an Associate Professor at University of Petroleum & Energy Studies, Dehradun."